In the morning of November 22, 1718 the boarding is launched, a wild fight follows. The frightening pirate Blackbeard and lieutenant Maynard of the Royal Navy meet. They engage in a duel with the pistol. Blackbeard is hit. Then they are confronted in sabre. The Lieutenant breaks under the attacks of his terrible opponent. Blackbeard hurls on him to deliver the fatal blow when a sailor stabs him the neck. 29 feb.- Adding an answer about the scurvy. 03 nov.- Adding 18 answers about Pirates & privateers, ships. 20 oct.- Adding three answers about the four most famous pirates, how pirates loaded the cannons and how was life on a pirate ship. 16 oct.- Adding an answer about clothes of pirates. 31 jul.- Adding a lots of questions / answers about piracy. 24 jul.- My paintings about piracy : look at the making of The Siege of La Rochelle. 04 jul.- Adding The Talk Like a Pirate Day and a glossary of ships. 03 jul.- The biography of NAU Jean David (L'Olonnais). 02 jul.- Adding The questions everyone asks about pirates and privateers. 20 jun.- Adding Olivier Levasseur aka La Buse and Blackbeard biographies. 19 jun. - Adding 81 pirates movies. 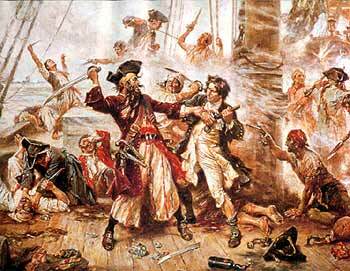 What a poignant way to open this website is the terrible fight between the famous pirate Blackbeard and Lieutenant Maynard! This website abounds with exciting true stories about pirates and privateers and useful maritime information for students, professors, historians and enthusiasts. You will soon be sailing the sea of information and emotions on this site! Enter the universe of the flibuste, the PIRATES & PRIVATEERS! » See the 114 questions/answers. 85 BIOGRAPHIES OF PIRATES & PRIVATEERS ! Pirates & Privateers of FICTION or REALITY?